Our online registration for BT Race for a Cause has closed! Registration is still available in person at Bottomline Technologies, 325 Corporate Drive, Portsmouth, NH from 12:00-4:00 PM on Friday, September 21st. If you cannot sign up before race day, registration will continue race morning beginning at 9AM at Bottomline Technologies. 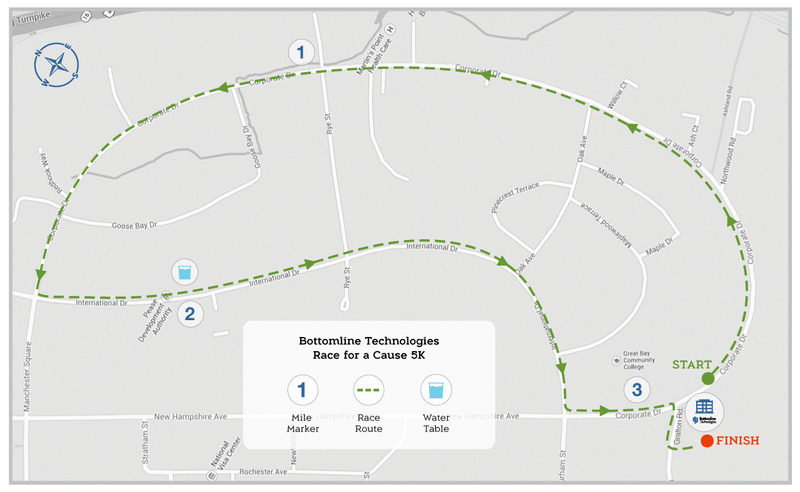 Bottomline Technologies presents its 5th annual 5k Race/Walk and a Kids Fun Run, this year to support CASA of New Hampshire. Each year Bottomline Technologies puts on this event to support a local organization located in the greater Seacoast area. The proceeds from the upcoming 2018 race will go to benefit Court Appointed Special Advocates (CASA) of NH. Since 1989, CASA of New Hampshire has represented more than 10,000 children in the family court system who have suffered from abuse or neglect. The key to CASA’s program is its capable and caring volunteer advocates who represent a child victim of abuse or neglect in the court system, providing critical information and making recommendations that directly and profoundly impact the child’s future. Last year, more than 450 powerful, effective and caring volunteer advocates provided a voice for more than 1,400 children statewide who were placed at incredible risk by their parents or caregivers. In Rockingham County alone, 73 volunteers advocated for 166 children from 103 families. Together, we can make a difference in helping those in need. To beat race day registration lines, pick up your race packet on Friday, September 21st at Bottomline Technologies from 12:00-4:00 PM. In this packet you will receive your racing bib, T-Shirt, and a gift bag with other special gifts. If you are unable to pick up your packet at this time, packet pick up will resume at 8:30 AM the morning of the race at Bottomline Technologies Corporate Headquarters in Portsmouth, NH. Waiver: (Must be Signed) I know that running a road race is a potentially hazardous activity. I should not enter and run unless I am medically able and properly trained. I agree to abide by any decision of the race official relative to my ability to safely complete the run. I assume all risks associated with running this event including but not limited to falls, contact with other participants, the effects of the weather, including low temperatures, windy conditions, and precipitation, traffic and conditions on the road; all such risks being known and appreciated by me. Having read this waiver and knowing these facts and in consideration of your accepting my entry, I for myself and anyone entitled to act on my behalf, waive and release the city of Portsmouth, race directors, beneficiaries, all sponsors, their representatives and successors from all claims or liabilities of any kind arising out of my participation in this event.